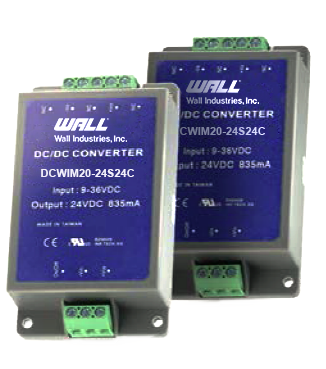 The DCWIM20 series of DC/DC power modules offers 20 watts of output power in a fully encapsulated 3.78” x 2.13” x 0.92” plastic case with chassis or DIN-Rail mounting. 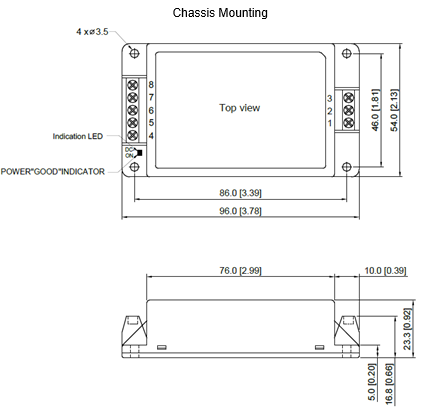 This series consists of fully regulated single output models with an ultra-wide 4:1 input voltage range and high efficiency to 91%. Each model has RoHS & REACH compliance, remote On/Off control, and over load, over voltage, and short circuit protection. 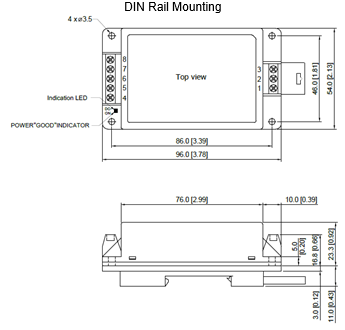 This series also has UL/cUL/IEC/EN 60950-1 safety approvals and CE markings. Please contact factory for order details. 2. Transient recovery time is measured to within 1% error band for a step change in output load of 75% to 100%. 4. It is recommended to protect the converter by a slow blow fuse in the input supply line. 5. Other input and output voltages may be available, please contact factory.